This is a blog about communication, or more specifically, about communication at work. I’m a ‘comms person’ by trade. I run a small internal communications and creativity agency in the north west of England and I spend much of my time doing what my clients want … leading comms projects, writing, training, advising, running workshops, trying to look serious … that sort of thing. That’s great. I like that. But I’m growing particularly interested in the space where communications and creativity meet – the space where workplace communication benefits from, and drives, creativity in the organisation. And that means being creative in the way we communicate, looking at things differently, learning from other industries and from science (particularly neuroscience) as well as gaining inspiration from the philosophers, thinkers and innovators from history. I have a bit of a problem about the fact that the word creativity has been hijacked by the ‘creative arts’. I’m on a mission to wrestle it back. Workplace communication is an essentially human activity, so we should look at it from a human perspective. I don’t claim to be an expert, or a philosopher, or a thought leader or anything like that. But I am a human, last time I looked. I just think we can learn a lot by understanding how the brain works – all of it – and how human behaviour is changing outside and inside the workplace. I also think we should all just lighten up a bit at work. 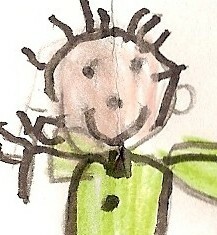 PS – My LinkedIn picture, above, was drawn by my daughter Millie when she was about two. She’s now ten but I do still look like that.